A Haat is usually refers to a local, rustic makeshift market in Indian villages and towns where people can buy a lot of wares for their daily use, home decoration or raw or prepared food stuffs. 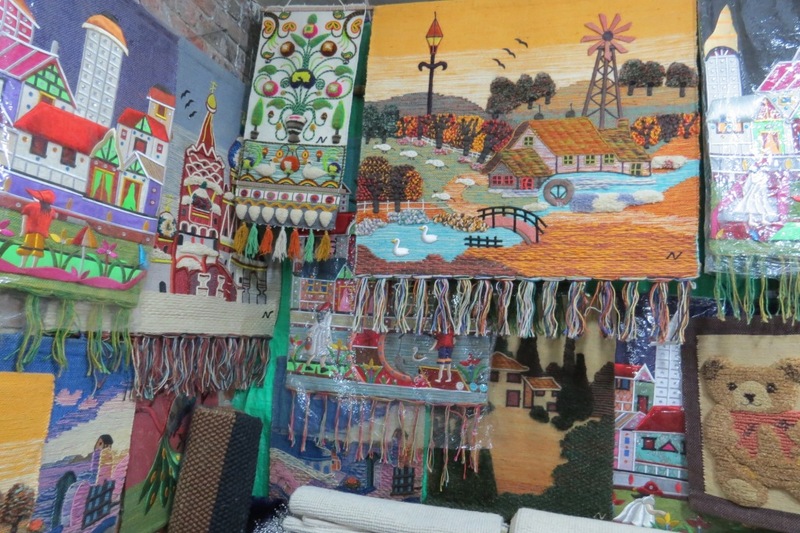 The concept of DILLI HAAT, which began operational in the year 1996, opposite INA Market, South Delhi took the definition of the haat to a wider perspective. 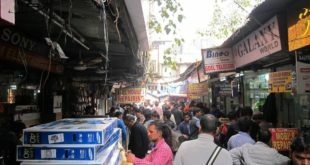 It carved out a strategically located place in busy central place of New Delhi, gave it to the rustic look and provided stalls to the various artisans of different parts of India. Similarly, the food of every part of the country was made available in the campus to the visiting guests. The Delhi Haat, or Dilli Haat, as is popularly known, is spread over in about six acres of land in the prime area of south Delhi. The stalls usually sells handicrafts, artefacts, clothes of various materials to the visitors. The rates of the wares are put up on competitive basis since there is hardly a middleman and the stall owner pays a meagre sum of Rs. 100 for a fortnight, to get a lease of the stall. Madhubani paintings or Mithla paintings, as they are known in local parlance are found in abundance. Beautifully carved out on pieces of hand made papers and clothes, these were usually carried out earlier on the newly plastered wall and on floorings . Janakpur, which is currently in Nepal was the originating place of Madhubani paintings. It is said that Raja Janak of Janakpur ordered the people to decorate his palace by creating murals of the traditions of the marriage of Lord Rama and Sita. Beautifully carved on the walls of the palace, these paintings were know to be the masterpieces of a form of art in contemporarey time. Basically, these pieces of art were used as the symbol of devotion towards the God Ram. 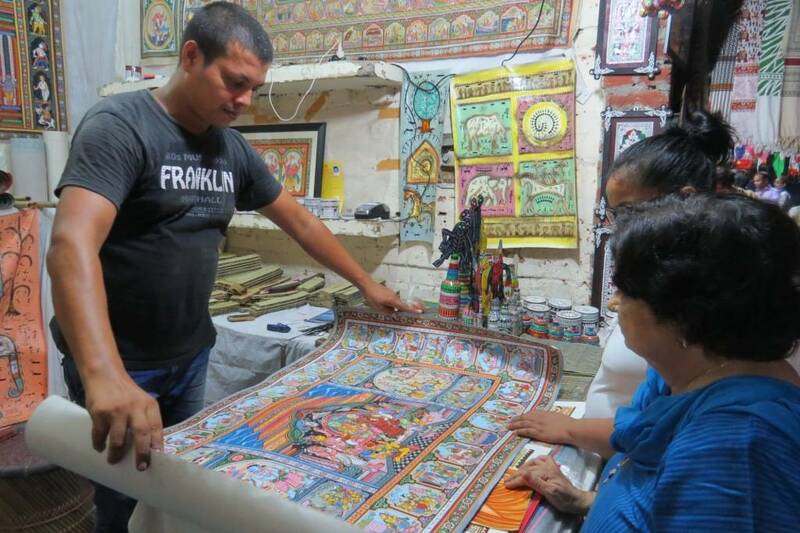 The Madhubani Art is dedicated to the Ramayan and its character Ram, Sita, Laxman, Hanuman God etc. Later, people practicing the art extended their area of interest or devotion to the other God and forms of the earth. 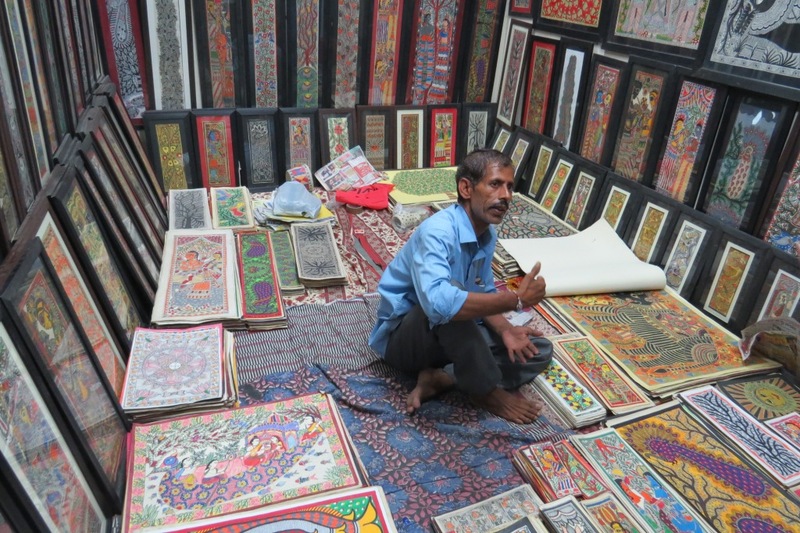 A number of stalls offer Madhubani art at an affordable price starting from about Rs. 500 to Rs. 5000, depending upon the intricacies of the design, its size, colours and design. The framing cost is incurred separately, but a little bargaining, say 10 to 15 per cent is not ruled out. 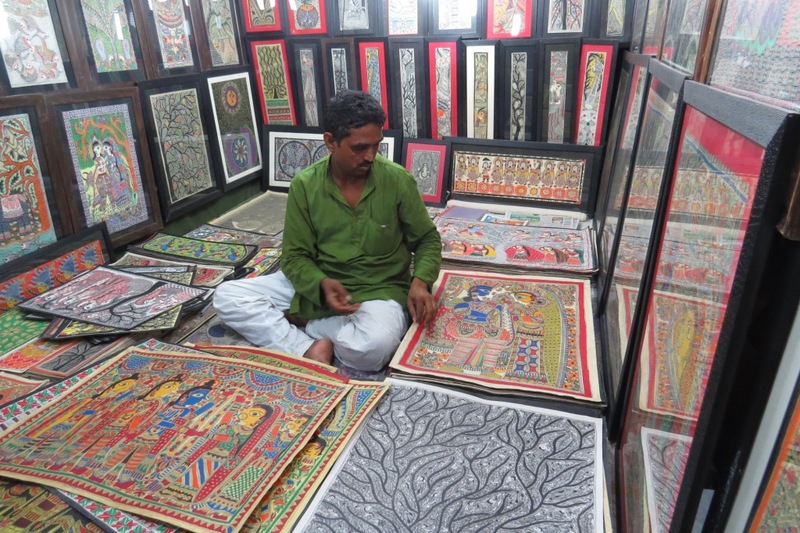 The Orissa style of paintings are also available in the stalls which though seems a little on the pattern of Madhubani, is quite different in stories and choices of colour dyes. They can be had from Rs. 200 to 6000. Bastar art or the art of tribal people representating Bastar in Madhya Pradesh is also available in story forms. Made of bronze, iron and gun metals, the tiny pieces tell their own storyline and are known for their décor value the world over. Bull, elephants, deer and miniature horses are their preferred creations. Their creativity and designing is not in any way lesser than the high end designers of the modern era. The vibrant colors, distinct designs and stories all points to a certain degree of professionalism. Artifacts of Dhokra Art of Chattisgarh are also a centre of attraction in the Haat. 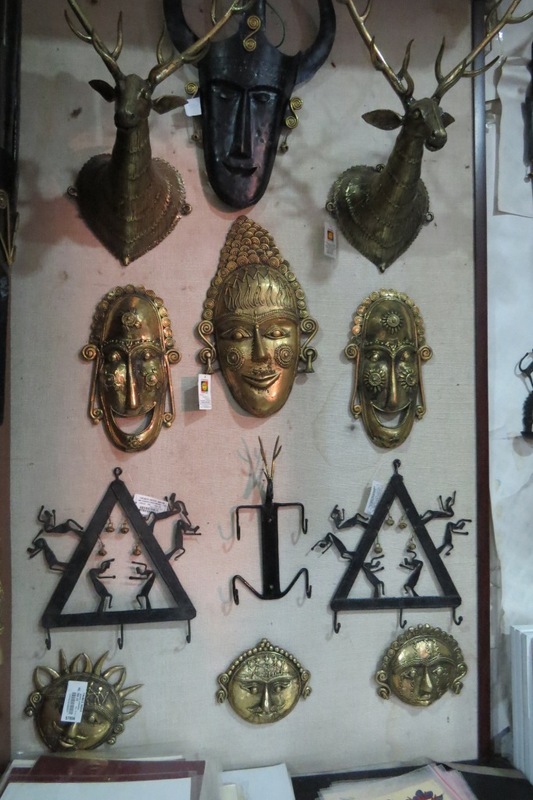 The products of home décor, handicrafts in wooden, marbles, stones etc are galore here. The engraved wooden pieces of miniature to huge furniture from Saharanpur, Stonecraft of marbles from Agra and Rajasthan, leather work from different parts of the country all are eye catching. Precious stones and jewellery from the states of India also attract people. The different style of home furnishing products from simple cotton to silk and other materials, rugs and carpets at a lesser prices, in different colours, shape and designs, material for curtains and tapestry—all are available here. The women can get the accessories for their make-ups in a number of varieties. The food lovers also throng the stalls of Rajasthan to Tripura, Kashmir to Bengal food stallsd where one can eat Uttapam, Dosa, to Chinese cuisines, Choley Bhature and exotic food from north East region, be in pure vegetarian or non-veg. 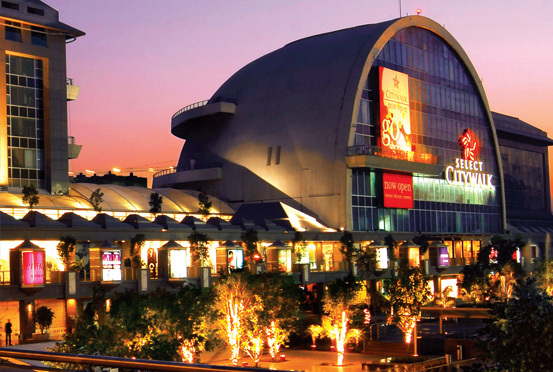 The campus is home to a number of cultural activities whenever the ocassions demand. 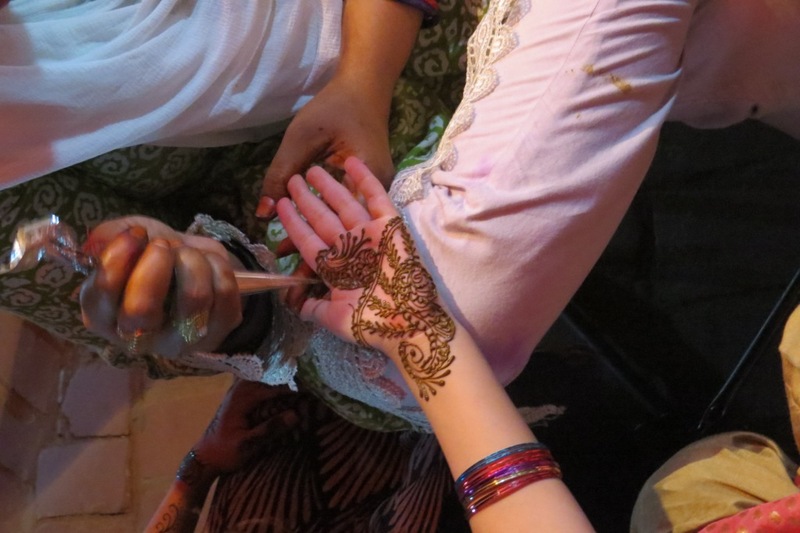 The ladies can get Mehndi applied on their hands in the Haat by the experienced stall owners there. All this at the rate of Rs. 20 per person is a big deal. Is not it ? The entrance and the campus of Dilli Haat is provided with the railings and curves which are friendly for physically challenged people. Clean toilets for men and women are also provided in the area. 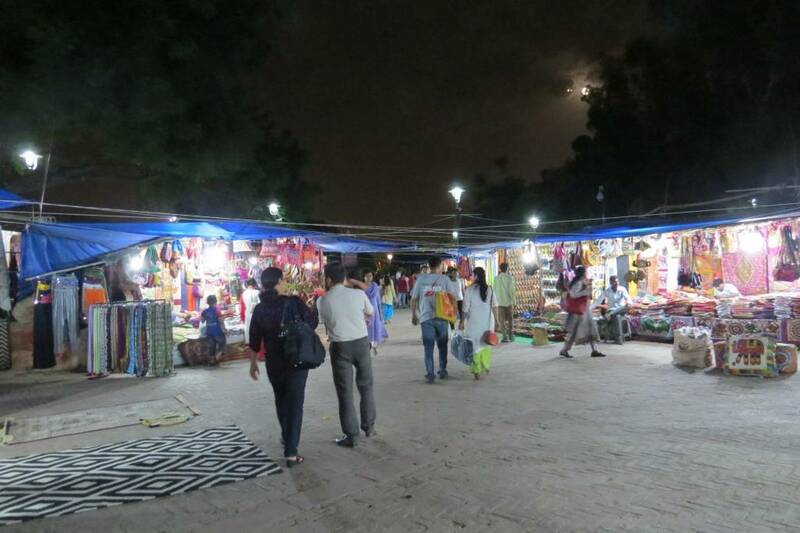 Dilli Haat opens at 10.00 AM and closes at 10 PM everyday. In winters day time strolling in the Dilli Haat is good but in summers, it is advisable to visit in evenings where one will evade heat and have a chance to see the gliterring glamour in lights there. Ample parking facilities are available but they charge parking rates on the per hour basis, i.e. Rs. 20 per hour for four wheelers. To reach Dilli Haat, one has to take Metro train route and alight at INA Market Metro Station which is the nearest point. 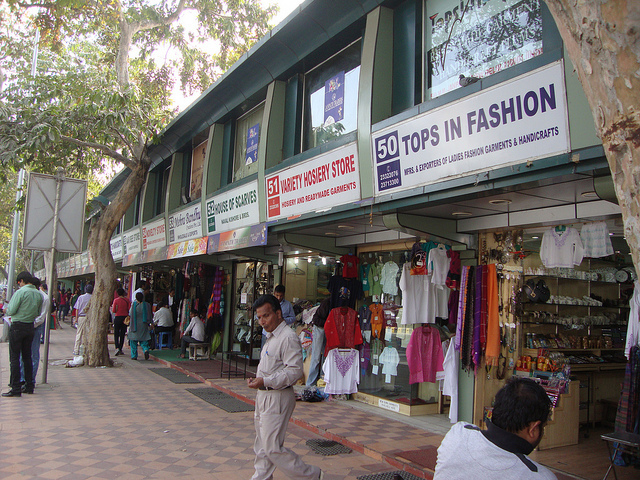 The address of the Dilli Haat is: Shri Aurbindo Marg, Opposite INA Market, near Laxmi Nagar. Buses plying from AIIMS to Safdarjung and vice versa stops there. People taking ring road can divert from AIIMS towards INA and reach INA bus stop to alight. Hope you liked our article on Dilli Haat. If you have any feedback or queries or you want to share your experience at Dilli Haat, you may leave your comments below. How to file FIR Online in New Delhi ? Thanks for the appreciation Yamini that you liked my post! You have also written a nice article, I liked the way you write. I would like to correct you that you mentioned that Cards are not accepted at Delhi Haat. However, there are 2-3 shops inside which allow plastic money as well. Nice. Never knew that such place exist in delhi though being an NCR resident. Thanks for sharing.